Has this scenario ever happened to one of your cashiers? The bell rings and before they can even sign into their POS stations, a line of kids is stretched around the whole cafeteria waiting for a hot, nutritious lunch. In many schools across the country, students get 30 minutes or less to go through the lunch line and eat their lunch. Often times, the lunch period might even be split with recess or other school activities. This makes the job of a cashier especially critical for making sure students get through the serving line as quickly as possible. Class rosters/Homeroom - This method is typically used at the elementary/grade school level and is the quickest way to identify students when they come into the cafeteria by class. Cashiers can speed up the process even further by having teachers organize their class in alphabetical order by the student's last name to match the order on the roster screen. 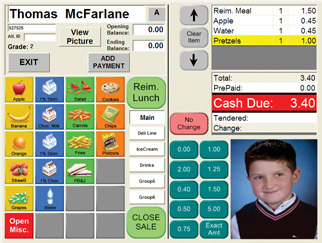 Many POS systems, like Heartland’s Mosaic system, support student pictures that can make spotting new students easier. Pin numbers - This is the most popular method and the easiest to implement. Students are assigned a unique ID number (usually 4-6 digits) that they can type into the pin pad at the register to access their account. This method is typically used in tandem with class rosters, since students in Kindergarten through 2nd grade are less likely to remember their numbers. ID cards - Many pin pad readers that come with POS systems allow you to scan barcoded ID cards to identify each student coming through the line. ID cards can be a little on the expensive side. If your district plans to print student ID cards, consider adding a barcode to it that can also work in the cafeteria. Fingerprint/Palm - Special biometric readers placed at the register allow students to be identified using a registered fingerprint or palm. This method can be expensive, but has the added benefit of reducing incorrect student identification. Waiting for each student to enter in their pin number can take up precious time during the serving period. If your POS system allows multiple students to enter their pin numbers or swipe their cards before a transaction is made, you can use this to your advantage. Simply, move the pin pad/barcode reader 3 to 4 students back from the front of the line. Get students in the habit of entering their pin number or scanning their card before they get up to the register. 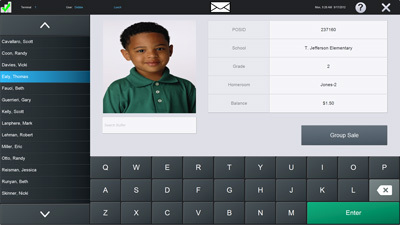 When the student gets to the front of the line, the student will have already been identified and each account will come up in the order they appear in the line! The trick to making this work well, is to find the sweet spot where the cashier does not need to wait for the student to type in their pin number or swipe their card. If the pin pad/barcode readers are too far away from the front of the line, students might get out of order or leave the line all together, creating confusion up at the register. 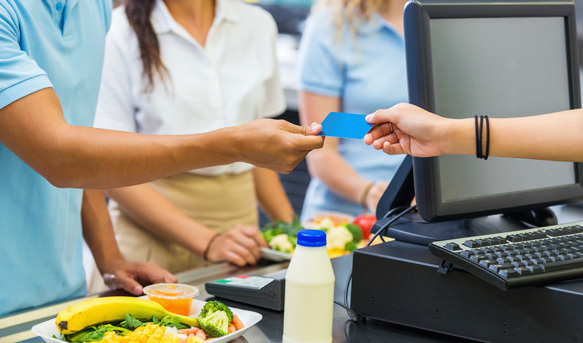 Open up serving lines before breakfast or after lunch to give students/parents more opportunities to make payments. For K-2 students, have teachers collect payments in the morning and bring them down before the serving period starts. Open up registers during open house and special events to give parents an opportunity to make a payment. If your district uses an online payment system like MySchoolBucks, remind parents that they can make payments online 24/7. Instead of giving a student their change back during a cash sale, have your cashiers ask them if they'd like to apply that amount towards their account. Many POS systems, including those from Heartland, have a built-in feature to facilitate this, which reduces the time spent making change. It also has the added benefit of keeping more money on accounts for future purchases. 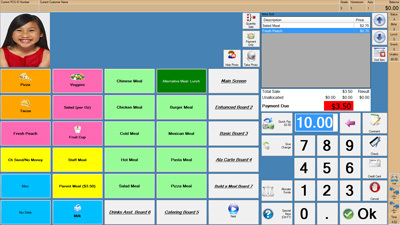 Placing the most popular items on your main menu board and sorting them from most common to least common. Reviewing the names of your items. Short, or even abbreviated names, are best for quick eye-scanning.